The Shorelands and Environmental Assistance Program help communities manage shorelands and wetlands. The primary focus is on state and local responsibilities for administering state and federally delegated laws. The bill will allow the Lakes Region waterfront owners and builders to efficiently schedule and manage costs concerning waterfront property modifications. The purpose is to preserve some of the natural beauties in and around the shoreland while improving the water quality, and hence the property value. 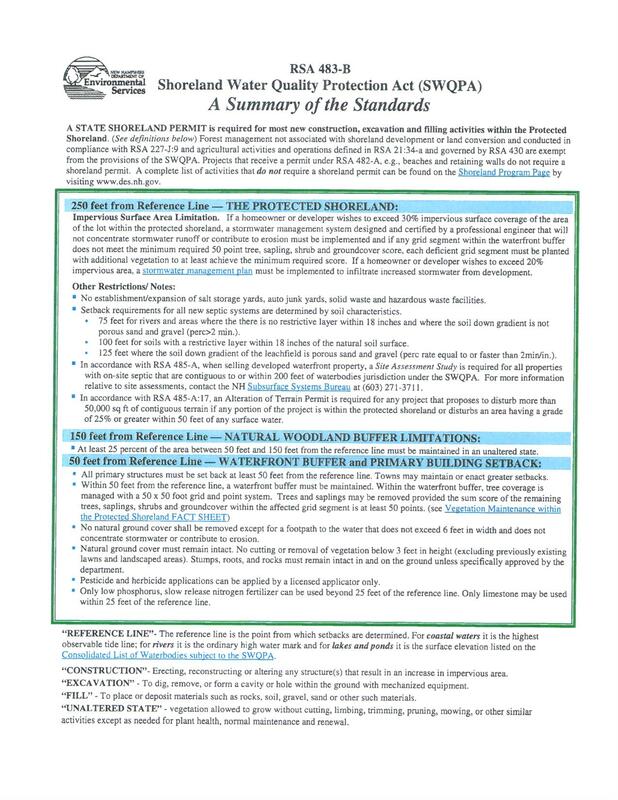 To help clarify this in further detail, please use this quick fact sheet below or visit the Shoreland Water Quality Protection Act frequently asked questions to answer any questions regarding the Shoreland program. For more information or questions on The Shorelands and Environment Assistance Program, please contact Nancy. To begin your real estate search in the Lakes Region, NH, view recommended searches. You can also register with the site to save your favorite listings, custom searches and for email updates on new properties. Follow the link below to go to the State's website for all Shoreland information.